We’d love your help. Let us know what’s wrong with this preview of Adoniram Judson by John Piper. Earnestly consider your role in completing the Great Commission. That was John Piper's overarching plea when he delivered a biographical message on Adoniram Judson in 2003. Though warned not to go to Burma, h Earnestly consider your role in completing the Great Commission. Though warned not to go to Burma, he entered the country almost 200 years ago — in July of 1813 — and there invested the next 38 years of his life preaching Christ where he had not been named. And the cost was very high. But in God's perfect economy, his suffering had a plain purpose. As Piper explains, "I am persuaded from Scripture and from the history of missions that God's design for the evangelization of the world and the consummation of his purposes includes the suffering of his ministers and missionaries." To ask other readers questions about Adoniram Judson, please sign up. Inspiring short read. Free Ebook at Desiring God. A rather brief biography of Adoniram Judson. Piper stressed more on the suffering he went through, which was very very immense. So many of his loved ones died, it was really unbelievable that a man could live through those experiences except by the Grace of God. Liked the way Piper put it by putting five points on the table for anyone who seeks to be part of the Great Commission. One point was clear, suffering is a prerequisite for to see the fruits of labor and the glory of God come. This was a short introduction to Judson. It's delivered as a short sermon, so don't expect a biography. To give one's life for the sake of the gospel seems like the ultimate call, but aren't we all called to do the same? Obedience has a price and that price has a purpose. Judson's life and story will inspire you to consider your obedience to the Great Commission. This book was a free download from Desiring God. This is a very quick overview of a missionary's life and ministry. It is aimed to inspire more to persevere through suffering knowing that God uses suffering as one of his main instruments in the spead of the Gospel and the ministry of the Church. John Piper writes to remind us that unless a grain of wheat falls to the ground and dies it will not bear fruit, but if it dies it will bear much fruit. for the success of his mission." 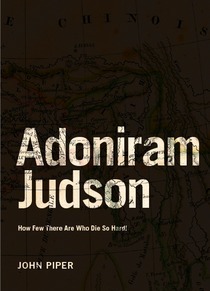 A short and quick read on the amazing life of Adoniram Judson. You will be shocked and inspired by what he and his family endured for missions. Even though he had moments of doubt and despair he never really gave up. A great example to many. Thanks to John Piper and Desiring God for making resources such as these available free to download and print! wow i would very much like to read an expanded biography of judson, his wives and life in burma. i always wondered what people meant with the phrase "die hard". know i know. wow. praise God for this man's life of service for the Gospel of Christ. I really enjoy reading this book and learned a lot about Adoniram Judson! This small book made me pray more and meditate of the preciosness of Great Commission, the ways how God ordains his gospel to be spread; and finally estimate myself in the context of His work. Convicting, humbling, encouraging, powerful little book. Awesome read, very inspiring. This man gave his life for Christ, convicting testimony. Awesome read very inspiring. What can we sacrifice for Christ like Judson did. "The question for us is not whether we will die, but whether we will die in a way that bears much fruit." This was a great introduction to Judson's life and the mission that he was on. Piper did a great job of presenting biographical information in a way that allowed him to spur readers on into a life completely surrendered to God. Incredibly convicting, this is making me reevaluate some things in my own life. It was almost a five star book, but there were several spelling errors that at times d "The question for us is not whether we will die, but whether we will die in a way that bears much fruit." This was a great introduction to Judson's life and the mission that he was on. Piper did a great job of presenting biographical information in a way that allowed him to spur readers on into a life completely surrendered to God. Incredibly convicting, this is making me reevaluate some things in my own life. It was almost a five star book, but there were several spelling errors that at times distracted me. This is such a short book that it would be a perfect read-aloud for children who are interested in missions or Christian history. It spared none of the details, yet Piper presents them in a respectful way that allows anyone to read. A call to missions, and a challenge to die continually to ourselves. A biography of a man who gave up everything to bring the gospel to other parts of the world. pretty short but free on Desiring God. All of these missionary stories are good.. and free..